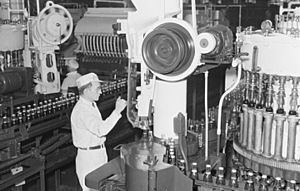 Coca-Cola bottling factory. January 8, 1941, Montreal, Canada. Coca-Cola, or Coke, is a carbonated soft drink produced by The Coca-Cola Company. Originally intended as a patent medicine to help cure colds and give people more energy. It was invented in the late 19th century and was bought out by businessman Asa Griggs Candler, whose marketing tactics led Coca-Cola to its dominance of the world soft-drink market throughout the 20th century. The drink's name refers to two of its original ingredients, which were kola nuts (a source of caffeine) and coca leaves. The current formula of Coca-Cola remains a trade secret, although a variety of reported recipes and experimental recreations have been published. 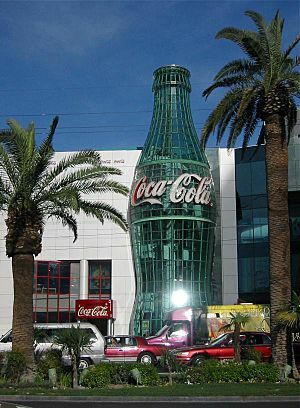 The Coca-Cola Company produces concentrate, which is then sold to licensed Coca-Cola bottlers throughout the world. The bottlers, who hold exclusive territory contracts with the company, produce the finished product in cans and bottles from the concentrate, in combination with filtered water and sweeteners. The bottlers then sell, distribute, and merchandise Coca-Cola to retail stores, restaurants, and vending machines throughout the world. The Coca-Cola Company also sells concentrate for soda fountains of major restaurants and foodservice distributors. 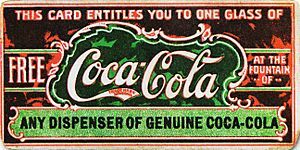 Believed to be the first coupon ever, this ticket for a free glass of Coca-Cola was first distributed in 1888 to help promote the drink. By 1913, the company had redeemed 8.5 million tickets. This Coca-Cola advertisement from 1943 is still displayed in Minden, Louisiana. 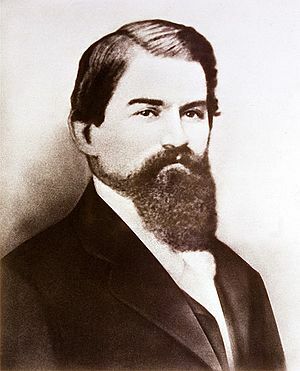 Confederate Colonel John Pemberton, who was wounded in the American Civil War and became addicted to morphine, began a quest to find a substitute for the problematic drug. 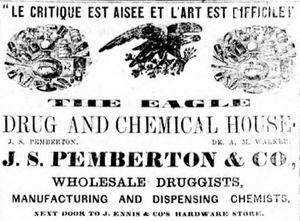 The prototype Coca-Cola recipe was formulated at Pemberton's Eagle Drug and Chemical House, originally as a coca wine. It is also worth noting that a Spanish drink called "Kola Coca" was presented at a contest in Philadelphia in 1885, a year before the official birth of Coca-cola. The patent for this Spanish drink was bought by Coca-Cola in 1953. The first sales were at Jacob's Pharmacy in Atlanta, Georgia, on May 8, 1886. It was initially sold as a patent medicine for five cents a glass at soda fountains, which were popular in the United States at the time due to the belief that carbonated water was good for the health. Pemberton claimed Coca-Cola cured many diseases. The first outdoor wall advertisement that promoted the Coca-Cola drink was painted in 1894 in Cartersville, Georgia. Cola syrup was sold as an over-the-counter dietary supplement for upset stomach. By the time of its 50th anniversary, the soft drink had reached the status of a national icon in the USA. In 1935, it was certified kosher by Atlanta Rabbi Tobias Geffen, after the company made minor changes in the sourcing of some ingredients. Original framed Coca-Cola artist's drawn graphic presented by The Coca-Cola Company on July 12, 1944 to Charles Howard Candler on the occasion of Coca-Cola's "1 Billionth Gallon of Coca-Cola Syrup." Claimed to be the first installation anywhere of the 1948 model "Boat Motor" styled Coca-Cola soda dispenser, Fleeman's Pharmacy, Atlanta, Georgia. The "Boat Motor" soda dispenser was introduced in the late 1930s and manufactured till the late 1950s. Photograph circa 1948. 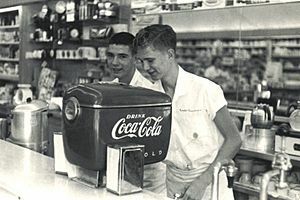 The longest running commercial Coca-Cola soda fountain anywhere was Atlanta's Fleeman's Pharmacy, which first opened its doors in 1914. Jack Fleeman took over the pharmacy from his father and ran it until 1995; closing it after 81 years. 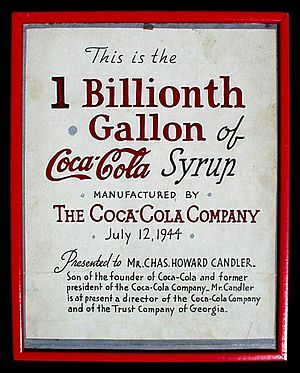 On July 12, 1944, the one-billionth gallon of Coca-Cola syrup was manufactured by The Coca-Cola Company. Cans of Coke first appeared in 1955. On April 23, 1985, Coca-Cola, amid much publicity, attempted to change the formula of the drink with "New Coke". Follow-up taste tests revealed most consumers preferred the taste of New Coke to both Coke and Pepsi but Coca-Cola management was unprepared for the public's nostalgia for the old drink, leading to a backlash. The company gave in to protests and returned to a variation of the old formula using high fructose corn syrup instead of cane sugar as the main sweetener, under the name Coca-Cola Classic, on July 10, 1985. A typical can of Coca-Cola (12 fl ounces/355 ml) contains 38 grams of sugar (usually in the form of HFCS), 50 mg of sodium, 0 grams fat, 0 grams potassium, and 140 calories. On May 5, 2014, Coca-Cola said it is working to remove a controversial ingredient, brominated vegetable oil, from all of its drinks. Coca-Cola contains 34 mg of caffeine per 12 fluid ounces (9.8 mg per 100 ml). The exact formula of Coca-Cola's natural flavorings (but not its other ingredients, which are listed on the side of the bottle or can) is a trade secret. The original copy of the formula was held in SunTrust Bank's main vault in Atlanta for 86 years. On December 8, 2011, the original secret formula was moved from the vault at SunTrust Banks to a new vault containing the formula which will be on display for visitors to its World of Coca-Cola museum in downtown Atlanta. According to Snope's, a popular myth states that only two executives have access to the formula, with each executive having only half the formula. However, several sources state that while Coca-Cola does have a rule restricting access to only two executives, each knows the entire formula and others, in addition to the prescribed duo, have known the formulation process. Pemberton's original formula is not the same as the one used in the current product. The Coca-Cola logo was created by John Pemberton's bookkeeper, Frank Mason Robinson, in 1885. Robinson came up with the name and chose the logo's distinctive cursive script. The writing style used, known as Spencerian script, was developed in the mid-19th century and was the dominant form of formal handwriting in the United States during that period. Pepsi, the flagship product of PepsiCo, The Coca-Cola Company's main rival in the soft drink industry, is usually second to Coke in sales, and outsells Coca-Cola in some markets. RC Cola, now owned by the Dr Pepper Snapple Group, the third largest soft drink manufacturer, is also widely available. During the 1980s, Pepsi-Cola ran a series of television advertisements showing people participating in taste tests demonstrating that, according to the commercials, "fifty percent of the participants who said they preferred Coke actually chose the Pepsi." Coca-Cola ran ads to combat Pepsi's ads in an incident sometimes referred to as the cola wars; one of Coke's ads compared the so-called Pepsi challenge to two chimpanzees deciding which tennis ball was furrier. Thereafter, Coca-Cola regained its leadership in the market. Coca-Cola was the first commercial sponsor of the Olympic games, at the 1928 games in Amsterdam, and has been an Olympics sponsor ever since. Coca-Cola has gone through a number of different advertising slogans in its long history. Coca-Cola has been prominently featured in countless films and television programs. Since its creation, it remains as one of the most prominent elements of the popular culture. A Coca-Cola fountain dispenser (officially a Fluids Generic Bioprocessing Apparatus or FGBA) was developed for use on the Space Shuttle as a test bed to determine if carbonated beverages can be produced from separately stored carbon dioxide, water, and flavored syrups and determine if the resulting fluids can be made available for consumption without bubble nucleation and resulting foam formation. FGBA-1 flew on STS-63 in 1995 and dispensed pre-mixed beverages, followed by FGBA-2 on STS-77 the next year. The latter mixed CO₂, water, and syrup to make beverages. It supplied 1.65 liters each of Coca-Cola and Diet Coke. The company sells many other products, including other sorts of Coca-Cola, such as Diet Coke (1981), Cherry Coke (1985), Diet Cherry Coke (1986), Diet/ Coke with Lemon (2001), Diet/ Vanilla Coke (2002), Diet/ Coke with Lime (2004), Coke Zero (2006), Coca Cola with Orange (2007), Diet Coke Citrus Zest (2007). Based on Interbrand's best global brand 2011, Coca-Cola was the world's most valuable brand. Old German Coca-Cola bottle opener. Coca-Cola sign in Fort Dodge, Iowa. Coca-Cola sales booth on the Cape Verde island of Fogo in 2004. An 1890s advertisement showing model Hilda Clark in formal 19th-century attire. The ad is titled Drink Coca-Cola 5¢. (US). Coca-Cola Facts for Kids. Kiddle Encyclopedia.